Are you a gardener with more produce than you know what to do with? Is the fruit falling off your tree and rotting on the ground? List your surplus on Local Carrot and sell or share it with your neighbors. We have created a community for gardeners to share their extra produce with people looking for healthy, locally-grown foods. Local Carrot brings together people who like to trade seeds, plants, eggs, honey, compost, or any other harvests with their neighbors. Don't let great, healthy food go to waste, share it on Local Carrot - The Garden Produce Exchange. 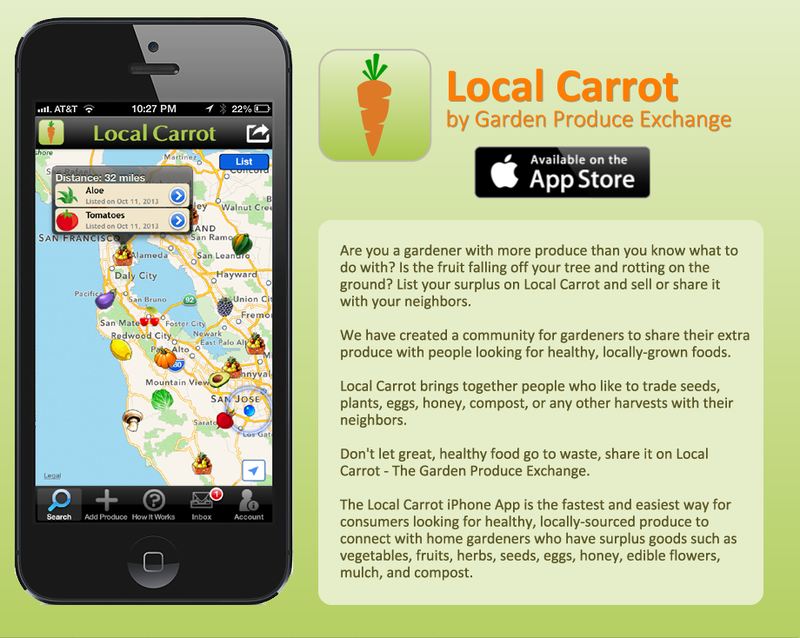 The Local Carrot iPhone App is the fastest and easiest way for consumers looking for healthy, locally-sourced produce to connect with home gardeners who have surplus goods such as vegetables, fruits, herbs, seeds, eggs, honey, edible flowers, mulch, and compost. Join the sharing economy today through Local Carrot. It's good for your health, strengthens your community, saves the environment, and is great for your wallet!